The New Environmental Land Management Scheme: putting life back in the countryside? In the week when Meurig Raymond succeeded Peter Kendall as the President of the NFU (seehere), Defra has announced (see here) more details about how farmers will be rewarded to protect the environment and recover farmland wildlife. Details of the Environmental Land Management Scheme (NELMS) for England have emerged and I am pleased to say that we are pretty pleased with what is being proposed. 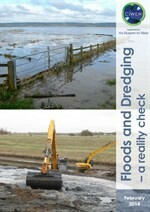 The RSPB has joined forces with angling and nature conservation organisations to support a new report by flood management experts (CIWEM) critiquing the contribution that dredging can make in preventing future floods. You can read the report here. While trying to find a paid job in nature conservation in the early 1990s, I volunteered for various organisations doing a whole range of things. My most memorable experience came while trying to raise money for elephant and rhino conservation – appearing in 'Hello' magazine dressed as a rhino while hugging Helena Christensen and Ali MacGraw. A few people have asked to see my letter published in the Times today in response to Alice Thomson's piece on the Somerset Levels last week. Here is the text as we submitted it. A cut-down version appears online - which you can only read if you have a subscription. While the flooding threatens to bring more misery to more people, the political and media attention is shifting to money - money to deal with the clean up and money to make the country more resilient to future extreme weather events. Flooding: have we learnt our lesson? While our politicians engaged in a colourful (but highly unproductive) 24 hours of finger-pointing about who is responsible for the floods, rain continues to fall and water levels continue to rise across southern England. For much of Sunday afternoon, I was mentally preparing myself for a TV interview about the floods while the kids and I cleared up the mess in the garden created by the previous day's vigorous pruning (brought on by the nightmare that took place at Anfield). There was some misreporting on BBC Newsnight last night regarding our position on dredging in the Somerset Levels and Moors. For the record, this is our position. The RSPB manages over 2,000 acres in the Somerset Levels. With staff, volunteers and supporters living in the area, the RSPB have been closely involved in flood management for over thirty years.